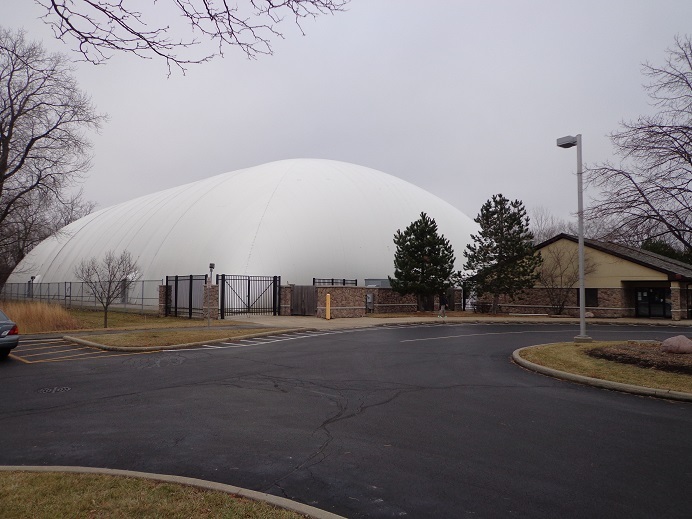 The Buffalo Grove and Sports Center, and Golf Dome, is the best place in Lake County to practice all winter long on your game. (847)-459-2321, or online at Bgparks.org. Happy Holidays from all of us at Golfers on Golf. We hope Santa brings you all the golf goodies your looking for, and plenty of great rounds in 2015. Make it a point to to play more in 2015 than you did in 2014, you will be glad you did. 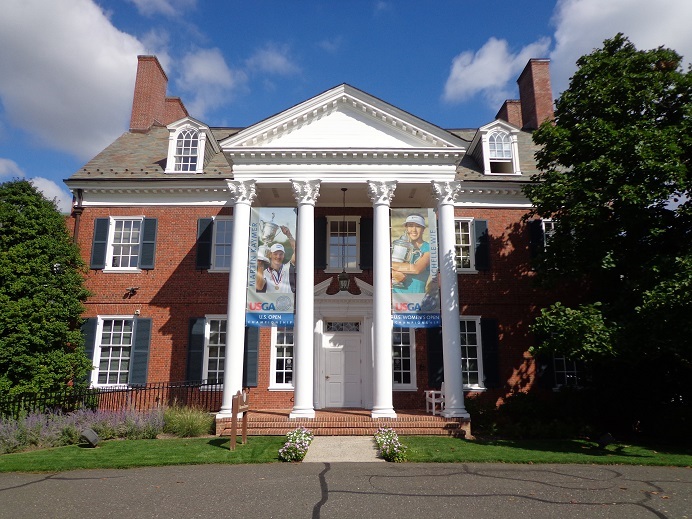 Have you ever been to Far Hills New Jersey, home of the USGA and the USGA Museum. 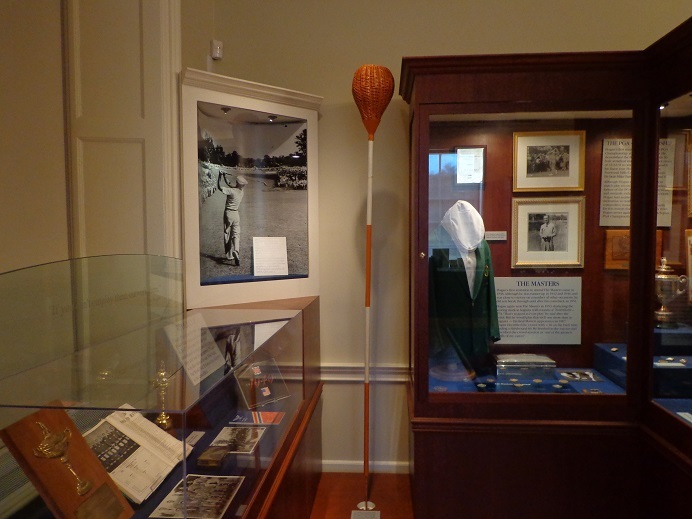 The museum is home to the Arnold Palmer Center for Golf History, and in 2015 home to the new Jack Nicklaus building. 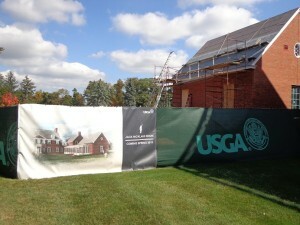 The Golf House Museum (L) and the new Jack Nicklaus building now under construction. When one tours the museum you can see over 50,000 artifacts. Some of the items on display include the champions medal won by Francis Ouimet in the 1913 U.S. Open at The Country Club. A painted portrait of Bob Jones, that sits near his famous Calamity Jane II putter. 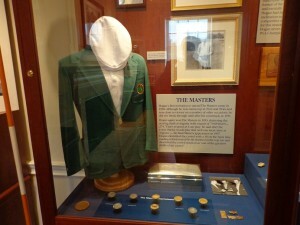 Ben Hogan’s Masters Green Jacket is looking over the famed 1-Iron that he used in his 1950 U.S. Open win at Merion. The Ben Hogan exhibit at the USGA Museum, is one of the most popular attractions. The USGA created a new history center, and it’s named for Arnold Palmer. The King is just one of the many golfers honored in the Museum’s Hall of Champions. 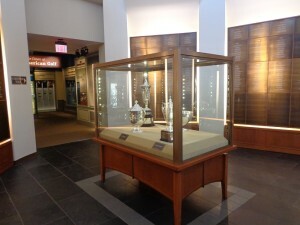 Found in the hall is the 13 original USGA Championship trophies. The champions of all the USGA championships since 1895 have their names on the walls. Trophies in the USGA Hall of Champions. Behind the museum is the Pynes Putting Course. The 16,000 square foot green was inspired by the Himalayas green at St. Andrews in Scotland. Guests can go putt on the green with replicas of clubs and balls from the 19th and early 20th centuries. The Pynes Putting Course is open to guests during regular hours from early spring until late fall. The Tee-times are available from 10 AM to 4 PM. 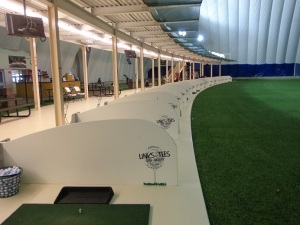 Visitors should allow about 30 minutes to play the 9-hole course. With your green fee, players get a souvenir golf ball to keep. This spring the Jack Nicklaus Building will open, giving guests even more to see. The building will be a tribute the greatest golfer in the games history. Hours 10 AM to 5 PM Tuesday-Sunday. The museum is closed on Mondays and on major holidays. Admission fee is $7 for Adults, USGA members $5, Group Rate (10 or more) $5, Children (13-17) $3.50 under 12 Free, Pynes Putting Green $5. Group Tours for 10 or more visitors are available, and the museum is available for special events. The Museum shop offers a range of gift items. The Golf Library is open to visitors Monday to Friday by appointment. The USGA Museum is located in Somerset County NJ., near the intersection of Interstates 78 and 287. It’s 30 minutes from Newark Airport. For more information see the museum website at usgamuseum.com. (908)-234-2300. *Paragraph from the USGA Museum brochure. LINKS & TEE’S ON LAKE STREET IN ADDISON. GIFT CARDS AVAILABLE FOR THE CHRISTMAS HOLIDAYS. (630)-233-7275 ADDISONPARKS.ORG. This entry was posted in News by Rory Spears. Bookmark the permalink. Rory spent over 8 years growing up working at Rob Roy Golf Club in Prospect Hts.IL, then two years at Chevy Chase in Wheeling. He has covered golf in Chicago since 1986. Rory was one of the initial members of WSCR all-sports radio Chicago and covered golf there for 5 seasons, before moving on to work for ESPN/Sportsticker and ESPN Radio. In addition to hosting Golfers on Golf Radio on WNDZ Am 750 Chicago, he writes for both Chicagoland Golf and the Chicago District (CDGA) Magazine. Rory has played over 460 courses in 37 states, and rates golf courses. He does golf course management and communications consulting, in the golf industry.